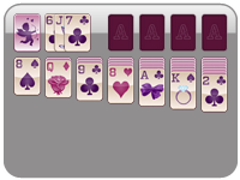 Let your love show for Solitaire Valentine's Freecell Solitaire! 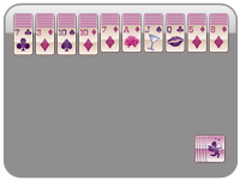 This game is played with a full deck of cards. 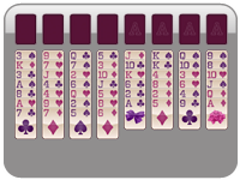 Stack cards in descending order, alternating colors. Place all the cards into the upper four right stacks according to suit from Ace to King to win the game. 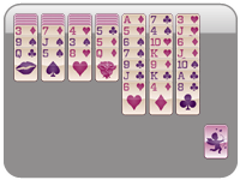 In Freecell Valentine, you cannot always move an entire stack in one move. 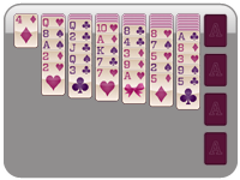 The number of cards you can move is fully dependent on how many "free cells" (the four cells in the upper left corner) and spots on the board are open. 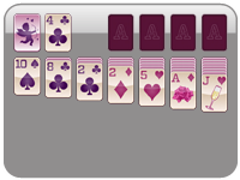 You may move the card you are grabbing plus the number of cards that corresponds with the number just described. Free cells are used as holding containers for cards you may want to strategically eliminate from the playing field at that time. You can pull a card in or out of these at any time. This game is one of the most loved solitaire card games out there, so stick around and play Freecell Soltiare Valentine over and over again this Valentine's Day! Place cards in descending order on the tableau. Use the free cells to hold cards. Place the tableau and free cell cards into the four foundations in ascending order (Ace to King).